Hoss' Loaded Burgers opened up their first permanent restaurant after finding success in their food truck business, just as other food trucks have done thanks to Nashville's booming culinary scene. 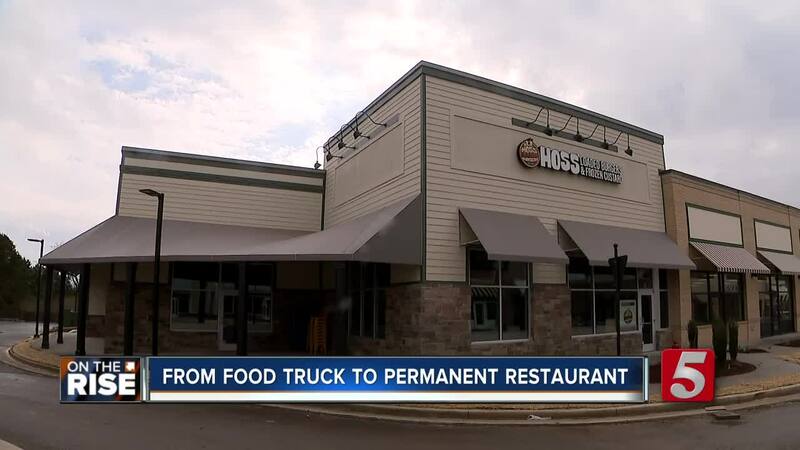 NOLENSVILLE, Tenn. (WTVF) — Food trucks have become a popular eating option in cities across the United States including Nashville, and with the success of the food truck business, many are opening permanent restaurants in addition to their food trucks. Shaw started Hoss’ Loaded Burgers in 2011 centered around the ‘Juicy Lucy’ style of cheese stuffed burgers, and they became a hit around town. Shaw eventually expanded to a second truck, and now in 2019, Shaw has traded in one of his trucks for his first permanent Hoss’ Loaded Burgers restaurant in Nolensville. “It’s been a dream come true to finally get to this point,” Shaw said. Located at 515 Burkitt Commons Avenue, just past Concord Road, the restaurant will be open 4:30-9 p.m. Monday through Friday serving dinner, and 11 a.m. to 9 p.m. Saturday and Sunday, serving lunch and dinner. Moving into a full-sized restaurant has allowed Shaw to expand the menu, adding onion rings, a loaded potato salad, and craft beer from Mill Creek, which is served on draft. One more exciting addition includes real frozen custard, available by the scoop, in milkshakes, or with custom mix-ins. The move from food truck to full-sized restaurant is one that many entrepreneurs have taken in Nashville following their food truck success. Businesses such as The Grilled Cheeserie have opened numerous locations in addition to the continued operation of their food truck. “Whereas the food truck is convenient because we’re going to people, it’s convenient here because they know we’re always going to be open when we say we will,” Shaw said of the permanent restaurant. In the long run, Shaw hopes to open more locations throughout the mid-state, but as of the opening of his first permanent restaurant, he’s simply happy to employ 15 team members and serve food to the local community. More information can be found on Hoss’ Loaded Burgers website .